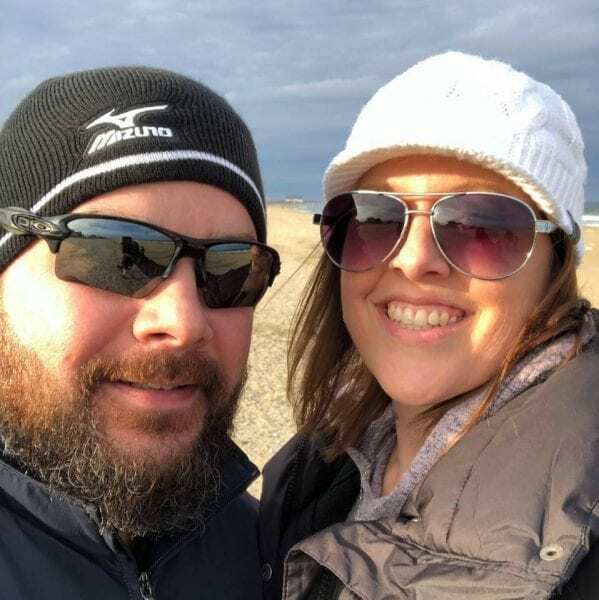 A Mechanicsville, Va., teacher and her husband who were killed Monday afternoon were among a group of six people walking along N.C. 12 when they were hit from behind by a pickup truck, Kitty Hawk police said today. A child with the group was injured and taken to The Outer Banks Hospital and released after treatment for minor injuries. Hanover County, Va. Schools posted a message from the principal of South Anna Elementary School that 5th-grade teacher Holly Nicolette, 37, and her husband Alan, 40, had died following the accident. “Mrs. Nicolette served as a 4th and 5th-grade teacher at South Anna for 13 years. During this time, she touched us all with her wonderful sense of humor, strong work ethic, and dedication,” Principal Alicia Cecil wrote. Police said the six people were following state law as they walked north on the southbound shoulder of N.C. 12 near Maynard Street. “The driver of the pickup truck was traveling in the northbound lane. The driver fell asleep at the wheel, crossed the center line and struck two adults and a child,” a police statement said. The man and woman were flown to Sentara Norfolk General Hospital where they were pronounced dead. “This is still an ongoing investigation. Charges against the driver are currently pending. The identities of all those involved have not yet been released,” the statement said. The driver “fell asleep” while driving in the afternoon? Is that code for passed out? What a shame that a lovely couple have lost their lives and a child has lost his parents due to such unfathomable negligence. The driver may have had a medical emergency. Do not judge so quickly. It is tragic. Period. Instead of spending money on beach replenishment Kitty Hawk and Kill Devil Hills should be spending money on a separated pedestrian/bike path along the beach road. Liz: They also may have had a needle stuck in their elbow. So don’t you judge so quickly. Ron: What you said makes sense; so you know it won’t happen here. I couldn’t agree more Ron Painter!! I tell tourists and locals ALL the time to never walk or ride a bike on the beach road in Kitty Hawk or KDH. Too many people looking for house rental numbers, looking at their cell phone, looking at bathing suits, falling asleep, drinking etc…Just too much going on with only having a little 6″ white stripe separating the pubic from a 3000 lb vehicle. No room for a multi use path in that area, and it wouldn’t have helped anyway in this circumstance. Let’s share in grief for these poor people and see if there’s any way our community can help this child who lost their parents. Awful. Unfortunately, anyone walking along 12 comes within inches of rear view mirrors rushing by. It is not obvious to visitors that it is an inherently dangerous place to be. Unmarked beach entrances and pedestrians with kids popping out into the roadway from behind high piles of sand add to the problem. Ron Painter, separated by what? A Jersey wall? Your solution would have done nothing for these folks. @ Scott…it doesn’t have to be a jersey wall. It could be a separated path like that in Nags Head. Maybe those extra feet of separation could have given them time to react. The fact is you don’t know if a solution like this would or wouldn’t have worked. However, why not put in the extra measure of safety. I don’t ride or walk in KDH or Kitty Hawk but I feel safe in Nags Head. If there is no room for something like this, then make it illegal to walk or ride down beach road in Kitty Hawk and KDH. If you’re thinking to yourself how crazy that sounds then ask yourself…How many more people have to die or get injured before something is done? Without a proper solution, does anyone actually think it’s going to get better? Having lived down here for over 25 yrs I recall the only pedestrian and cycling deaths that have occurred along the beach road have happened in Kiity Hawk and KDH. I haven’t heard anyone getting run down or accidentally running their bike into the sand in Nags Head or Southern Shores where the path is seperated from the road. This poor couple may have stood a better chance of survival with more reaction time if there had been a seperated path. I’m sure there is room for multi paths with in the right away. We are talking public safety folks. You can’t put a price on people’s lives. We want the tourist to come here and have a relatively safe time while enjoying the amenities we have to offer. My response earlier today was taken down for some reason. There was nothing objective in it so I will try this again but worded differently. There is room for a seperate multi path in the right away. We are talking public safety here folks. Don’t we want tourist and locals to be able to walk and bike along the beach road relatively safe? How well or not would this work? Separate walk/bike path with Strong poles on street side every 4 feet. 3 feet? Maybe 30″ to 36″ high. Heavy concrete anchors. With or without paint decor. One side only to start. Let’s get serious and talk this out. Such an awful loss my heart goes out the the families. Simple solution to keep the drivers alert is rumble strips just inside the white traffic stripe on both sides of the road and perpendicular rumble strips across the road spaced per NCDOT standards. Hats off to Liz (above) and cooler heads – driver was 81 yrs old. I find a tiny comfort that drugs / alcohol / tourists don’t appear to be a factor.